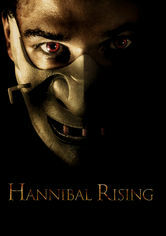 Hannibal Rising (2007) on Netflix Belgium. Check worldwide Netflix availability! If Hannibal Rising isn't available in your country, or you are visiting a country where it isn't, there is still a way to watch it! Director Peter Webber takes on the myth of Hannibal Lecter in this terrifying prequel that traces the murderous roots of the cannibalistic killer. Director Peter Webber takes on the myth of Hannibal Lecter in this terrifying prequel that traces the murderous roots of the cannibalistic killer.